The women’s movement in Jiu Jitsu has grown tremendously. We’ve gone from having “a women’s division” to having close to the same divisions as men when it comes to belt, weight and age. There are more and more women’s organizations offering open mats, seminars and camps. More and more academies are offering women’s classes. However, there is always room for improvement. 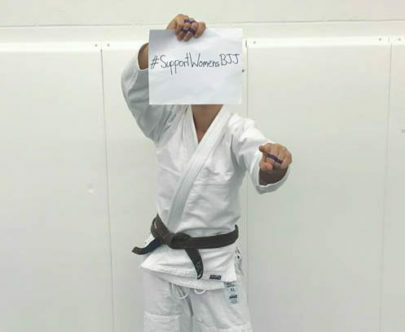 Supporting women’s Jiu Jitsu means more than just a hashtag. Actions are what change things. Here are five easy ways for you to support women’s Jiu Jitsu. Support Women’s open mats, events, seminars and camps. If you are one of one or two women at your school finding the community of women that share your struggles can be critical to your survival in Jiu Jitsu. Knowing that you are not alone in your challenges can make a world of difference. This is not an easy path but doing it with a group of strong and supportive women makes is a whole lot more fun. If you have 15 to 20 women training at your academy you understand firsthand the value of having a tribe of women supporting each other. And if you are fortunate enough to train with and learn from a legendary female black belt you understand the importance of learning from other women. But just because you have these amazing resources at your fingertips this doesn’t mean you can’t benefit from the other opportunities in the community provided for women. Go outside your norm and train with people who don’t know your game. Make friends with women from other academies and expand your knowledge base beyond your lineage. You can never know too much in Jiu Jitsu. We are living in a unique time for Brazilian Jiu Jitsu. There are more opportunities for females to train together than ever before. Take advantage of every opportunity. Support the women teaching and organizations that are providing these opportunities. 10 years ago, women would have given anything to have what we have today, so reap the benefits of the hard work and sacrifices of the women before us. It takes a lot of time and energy to teach a class. The women running women’s classes need your support. Just because there are maybe 5 or more ladies that train on a regular basis during co-ed class doesn’t mean that you shouldn’t support the women’s classes at your academy. Although women’s classes tend to attract lower belts, women’s classes are beneficial for all levels. It gives you an opportunity to connect and build camaraderie with your teammates. It is a chance to focus on issues that maybe only female grapplers face. It is an opportunity for upper belt to work together and inspire lower belts. Women are more likely to start training in a women’s class and they need role models to show them how far they can go. Actions speak louder than words. Change has been brought on by actions of the many women that have gone out and competed over the years and inspired others to do the same. It is the sheer number of competitors that has influenced companies like IBJJF expand their divisions for women by rank, weight and age over the past decade. Take advantage of these opportunities that have opened up for women. The more women we encourage to compete, the more money these companies make and the more opportunities we will have and the closer we will get toward equality. So, support the women in your academy and encourage them to compete. The more they compete the more they will see that it isn’t this big scary experience. It is an opportunity to test themselves and grow as practitioners. Value your work and work together. You wouldn’t go to the doctor and expect them to treat you for free just because the doctor loves what they do. Same applies to women’s events and workshops. Just like any other service or profession female instructors and organizations facilitating these opportunities deserve to be compensated for their contribution. More work goes into making women’s event and workshops happen than most realize. For those that do it they know it isn’t easy and requires a lot of time, energy and resources to make it happen. By charging for your events and workshops, you are creating more opportunities for women to get paid teaching and further themselves professionally in the art. Place a value on your events and workshops and the work that is put into making them happen. People will value your work more if you do. We advocate that we are all in this together, right? So let’s all work together and do what is best for the community when planning women’s events, camps, seminars, workshops and open mats. The more promoters communicate between each other the more it can benefit the entire community. After all that is all of our goal! To unify the community and bring together everyone. Reach out to other women who have taken steps to start providing opportunities for women in Jiu Jitsu and work together to do what is best for everyone. Plan out your events, camps, seminars, workshops and open mats to maximize the turn out for everyone’s ventures. Cross promote each others women’s events, camps, seminars, workshops and open mats. Running these programs take a lot of time, energy and dedication. By making friends with others that are in the same boat you’ll find a support system to help encouraging you to keep on this path to help others. Value yourself as an instructor and competitor. Every industry you must pay your dues and put in the hard work. But there comes a time when you deserve to get paid. If you are teaching classes or seminars charge accordingly. Don’t sell yourself short when it comes to your compensation. Your time, energy and knowledge are valuable. You’ve spent a lot of time building up the knowledge and have invested in yourself. You paid your instructor to teach you. Now is your time to do the same. The same applies to if you are competing professionally. Don’t undersell your value as a competitor. Don’t just compete professionally for the love of it. Your male counterparts that are getting paid 2x-3x more than you sure aren’t. Don’t take offers that are below you and don’t compete in tournaments that are not willing to recognize your value. If none of us take the low ball offers than promoters have no choice but the raise the standard. Again, we may love Jiu Jitsu but that doesn’t mean FREE. It doesn’t mean that you must compromise your value for the sake of benefiting others or gaining exposure. The more we all hold ourselves to a higher standard the higher that standard becomes. And then there won’t be any more talk of equal pay because it will be the norm. Nice article. This should helps Brazilian women’s in Jiu Jitsu.